Below is a list of 101 of the best fingerpicking patterns ever, ranging from beginner up to advanced. When writing each pattern I tried hard to think of all of the most common patterns used in popular music and took inspiration from the finest fingerstyle players to have ever walked the face of the earth. The patterns have been modelled on fingerpicking guitar heroes such as Tommy Emmanuel, Chet Atkins, Lindsey Buckingham, John Mayer, Jerry Reed, Merle Travis and even Paco de Lucia. The first dozen or so fingerpicking patterns work on building the foundations that you truly need to grow and become successful at fingerstyle playing. They focus heavily on training your fingers to know where the strings are and to always play the right one, eventually without even having to think about it at all. After this we move into the world of travis picking and steal fingerpicking patterns from songs such as Dust in the Wind and Never Going Back. 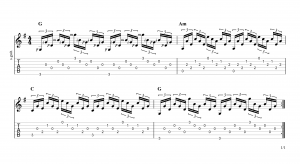 We look at 8th note patterns, 16th note patterns, triplet patterns, shuffle patterns, fast patterns, slow patterns, quick finger rolls across all six strings and a whole load more. There's patterns that teach you how to add percussive taps to your playing and even bass note slaps with the thumb. There's patterns that show you how to mute the bass strings and get your playing to sound less cluttered. Patterns in odd time signatures, odd groupings and there's even patterns showing you how to practise tremolo technique. 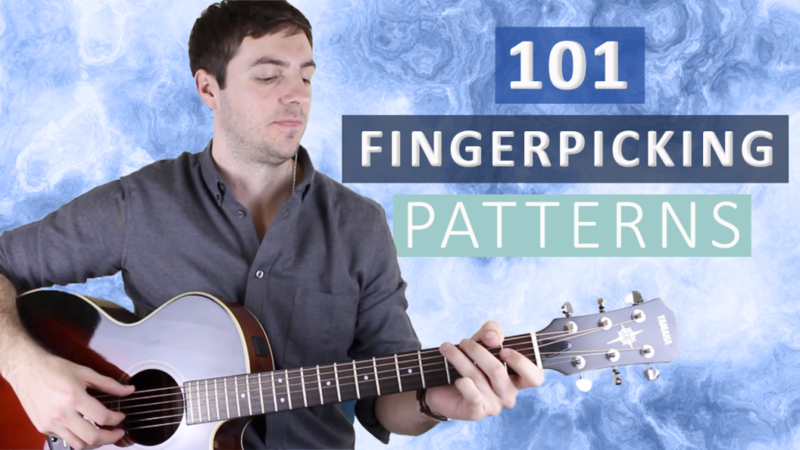 These 101 fingerpicking patterns have the potential to completely transform your fingerstyle guitar technique, and will give you a colossal list of patterns that you can always come back to, to either learn more or spark some creativity in your own writing. Every fingerpicking pattern is played over the exact same three chords - G, Am and C - and I created it this way so that the right hand does all the hard work. All the left hand has to do is change chords on each bar, other than that you don't have to worry about it. I strongly encourage you to try every fingerpicking pattern you learn on your own chord progressions, and get creative by writing some of your own patterns. I used the same three chords to keep things as simple as possible for learning, but be sure to venture off on your own when you're ready to. My fingerings are there as a guide and to show you how I personally play them. I do recommend paying attention to each one, at least until you really get the hang of fingerpicking. There are no strict rules and I'm all for breaking convention, but there are rough guidelines you should follow. I recommend practising each fingerpicking pattern with a metronome, start very slowly and gradually build up speed. Each fingerpicking pattern has a 'target tempo' that you should try and reach, that way you'll know you've really mastered that particular pattern. But always, ALWAYS, ALWAYS go for accuracy over speed, every time. The speed will come naturally when it's ready to once you've repeated the pattern enough times. I really hope you enjoy all the fingerpicking patterns and that they bring you lots of musical joy. Sky rocket your fingerpicking skills by gaining access to ALL 101 video lessons for each fingerpicking pattern. For just £18.00 (approx. $24) you'll be guided through every single lesson and be shown how to play each pattern with perfect technique. TAB included with each video lesson. Purchase the video lessons now and take your playing to the next level! This first pattern is all quarter notes (crochets) and alternates between the bass note (lowest note of the chord) and the G string. If you've never played with a metronome before, set it to 60 bpm (beats per minute) and see if you can play each note at exactly the same time as you hear the click, whilst counting "1 2 3 4." Practise with out the click first and bring it in once you can play the pattern consistently without having to pause at all. This pattern is the same as pattern one but now we're playing 8th notes (quavers). One 8th note is equal to half of a quarter note. So here you're playing twice as many notes as in pattern 1 and therefore also having to play twice as fast. You count 8th notes '1 & 2 & 3 & 4 &'. If quarter notes are worth one beat and eighth notes are worth half a beat, then triplets are worth a third of a beat. This means that you play 3 notes in the course of one crochet beat. Triplets are counted ' 1 trip let, 2 trip let, 3 trip let, 4 triplet'. 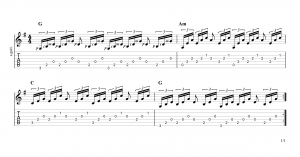 This fingerpicking pattern uses 16th notes (semiquavers). There are 4 sixteenth notes per beat and they are counted '1e&a 2e&a 3e&1 4e&a'. Once you can play the pattern with smooth changes then bring in the metronome! This pattern is the same as the previous one but in reverse. This will build strength in your weaker fingers. Here we mix things up and start weaving in and out of the strings, again building strength where you need it. Still using 16th notes here, just with a slight variation on the previous pattern. Here we've returned to quavers and are arpeggiating (picking the notes inside the chord) each chord. Notice that the tempo of the metronome has risen slightly. This fingerpicking pattern is the same as the last but in reverse. In this pattern the bass note lands on the '&' of '2'. Typically with fingerpicking the bass notes lands on the beat, as you can see by shifting it over one 8th note it adds a nice feel. Still new to fingerpicking and want to make sure you're getting off on the right foot? I recommend trying my 'Complete Beginner's Guide to Fingerpicking' guitar course. This course will put you on the right track with fingerpicking and set you up correctly to learn all 101 fingerpicking patterns with great technique. In pattern 11 we're taking our two weakest fingers and paying them together on beat 2 on the B and E strings. 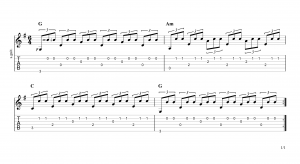 More 16th note fingerpicking patterns coming up here with a slight increase of the click. Always strive to achieve complete evenness between the strings. One last 16th note pattern for the time being. Now we start playing notes simultaneously. Make sure that as you play any two notes together that they sound at exactly the same time. Often people don't realise that they're not quite in sync with each other. For the next two fingerpicking patterns we're going to start moving the thumb across the bass strings. As you work you way through these patterns the need for a rock solid and constantly accurate thumb increases. Don't over look this pattern, it's absolutely crucial! The thumb now skips across three strings here making accuracy much harder. Travis picking was popularised by the fingerpicking legend Merle Travis, and it usually involves the thumb alternating between at least two bass strings; the remaining fingers fill in in-between. It's difficult to line up your thumb correctly at the begining and you'll likely find yourself knocking the wrong string from time to time. Don't worry about it, just keep going! We're mixing 8th notes and 16th notes here. Dust in The Wind was a huge hit for the band Kansas in the 70s and it's a great song to learn for any budding fingerstyle guitarist. This pattern has been ever so slightly simplified from the original song. This is the exact fingerpicking pattern that is used to play Dust in The Wind. It's only one note different from the last one, but that one note makes a big difference because it's hard to sneak it in and still remain on time. Get this one and you're really travis picking! The added note on the '&' of '4' makes this one tricky. Purchase the video lessons now and really master all 101 patterns! These next two fingerpicking patterns are harder than meets the eye. Really make sure to get the rhythm tight with the metronome. Here the 2nd (the counts of 'e') of each group of sixteenth notes has been removed. Let's get back to some triplet roll fingerpicking patterns now and try and raise the tempo a bit. Remember to keep it even across all the strings. Here we combine the previous two fingerpicking patterns. Now we're going to look at some shuffles. The traditional shuffle rhythm is basically repeated triplets but with the second note of each triplet grouping removed. This is really common in many many styles of music but is especially prevalent in blues. Here's another shuffle for you. Back to some triplet fingerpicking patterns, but from now on we're really weaving in and out of the strings and creating more musical possibilities. Watch your fingerings on the next few triplet patterns, they're quite difficult to get to grips with. However, these are superb rolls that will greatly impress and really sound fantastic! With a bit of practice you can get these patterns moving really fast! Keep on nudging up the click. This pattern combines ascending and descending triplet rolls. It's great fun to play because it's a continuous cycle. The next seven fingerpicking patterns focus on independence across all of your right hand fingers. The thumb is constantly alternating across all three bass strings and your remaining fingers are playing melody lines. With enough practice it starts to sound like there's two guitars playing at the same time. This concept of making one guitar sound like two has been a lifelong study for players such as Tommy Emmanuel and Chet Atkins. Really make sure your thumb is consistently accurate on the bass notes. Playing notes constantly together can be quite challenging but often sounds great! The thumb isn't working quite so hard on this one. Just making the smallest change can really throw a spanner in the works. If you're unsure what 6/8 time is, it means that you play 6 eighth note beats per bar. Up until this point everything that we have played has been in 4/4 time, which means that you play 4 quarter note beats per bar. 4/4 is the most common time signature we have in western music and 6/8 is not far behind. If you're playing along with the metronome, bear in mind that you'll play three notes to one beat as you do when you play triplets. You want to count each bar - 1 2 3 4 5 6 with the strong beats falling on 1 and 4. In this pattern there's been some sixteenth notes added; however, in 6/8 you want to count them as '&'. For example, for this progression you would count - 1 2&3 4 5 6. Here we're playing three notes simultaneously with the right hand. It can be a great alternative to strumming. 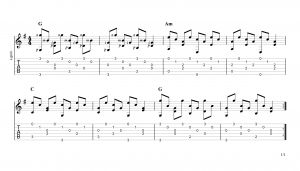 The next few fingerpicking patterns are focused on adding percussive taps to your playing. It's quite a tricky technique to get down but well worth the effort and the pay off is huge! Once mastered you'll have an important skill in your arsenal, and it all adds to helping you sound more accomplished. For this technique, think of it like you're taking on the roll of the drummer and playing the snare drum on the counts of 2 and 4. Once you add that in with the alternating bass your thumb is playing, then you're doing the parts of the guitar, drums and bassist! That's unbelievably cool and gives you a truly endless amount of possibilities for creativity. What other instrument is more versatile than the guitar? Now we're adding sixteenth notes in and this certainly makes it considerably harder, but all the more exciting. Stolen from John Mayer's beautiful song 'Stop This Train', this pattern is a real nasty one to get right and it personally took me many years to truly master. It's hard for a whole range of reasons but mainly because you're only using your thumb and first finger and are flying between the strings. This feels completely unnatural and is the opposite of everything else that we've covered so far in all these fingerpicking patterns. On top of that you also have to pluck a string with the back of your first finger playing a down stroke, again this is incredibly peculiar if you've not done it before. And, to make things just that little bit harder, you also have to include the percussive tap with your thumb on all the counts of '&' at the same time that you play the down pick with the back of your finger. Good luck! It's really tough, but honestly once you start getting to grips with it it isn't that bad, and it's sounds so good! Not as tricky as the last pattern but still has its challenges. Here it combines 8th notes with 16ths. Taken from the hit song 'More Than Words' by 'Extreme', here you play the bass notes and change chords on the counts of '&'. It really mixes things up and makes for a good rhythm alternative from always playing on the beat. Stealing again from John Mayer (although he's certainly not the only person to have done this), here we're slapping the bass string with our thumb and using just our first finger with it. If you've never slapped the bass string with your thumb before make sure to practise that first without any of the other notes included. It's tricky but you'll know once you get it because it will produce a slightly louder 'slapping' sound. By placing the bass slaps on different counts it can really produce nice rhythms. 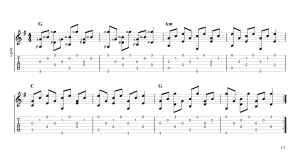 The next three fingerpicking patterns focus on working your way in and out of the chords. This can be used to great effect with practice, but demands right hand finger accuracy. This one's similar to the last pattern and quite challenging. This pattern uses the same idea but with triplets. Feel free to experiment with any division you like. Constantly playing notes in unison can be really demanding on the right hand. This pattern builds strength and sounds good. The next two fingerpicking patterns are in 3/4 time. If 4/4 means that you play 4 quarter note beats per bar, then 3/4 means that you play 3 quarter note beats per bar. I really encourage you to experiment with different time signatures. Again it will only open up doors to different possibilities. Here we're playing a constant bass note with the thumb and move all our other fingers across the strings. The same here but in reverse. Now we play it weaving in and out but as 16th notes, lowering the tempo by 20 bpm. However ,if you feel you can do it faster then go for it! This pattern will build strength and speed. This one's harder than it look so aim to gradually increase the tempo and see if you can get higher than 120 bpm. Take the same approach with this pattern as for the previous one. Let's start alternating the bass now. This feels very unnatural at first but stick with it. Again, this will very very uncomfortable at first. In 2/4 time now (2 quarter note beats per bar) and we're playing groups of five. This isn't something you see often in commercial music and tends to be more common among fusion rockers, but there is absolutely no reason whatsoever why we can't create good-sounding fingerpicking patterns with them. Start very slowly and, as always, put accuracy before speed. Now we're looking at groups of sevens, so we're cramming seven notes into one beat. It's pretty complicated and difficult to count so I've dropped the metronome right down to 60 bpm but feel free to go as low as you need to in order to be accurate. When up to speed these sound simply bonkers! You can count sevens like '1 2 3 4 5 6 7' or '1 & 2 & 3 & 4'. A common way to count groups of fives is to play a note on each syllable of the word 'hippopotamus'. Breaking it up to 'hip po pot a mus' leaves us with five easy to say syllables. Usually I hate counting time via the use of words but with fives it seems to work quite well. You can of course just count 1 2 3 4 5. Here we're using a combination of 16th notes and groups of fives. It's one thing playing fives or sevens on their own but to mix them in the same bar with other divisions is really very hard. Really try and get this one accurately played with the click at 60 bpm, and then experiment on your own and see if you can create something that sounds good. 16th note triplets are groups of 6 per beat, sometimes also called 'sextuplets'. The next 4 fingerpicking patterns are looking at tremolo technique. This is another very difficult skill that will require countless hours of practise but sounds very romantic once truly mastered. The idea is very simple - pluck a bass note with the thumb and then play another string 2/3 times after with the remaining fingers. But this technique is made to be played very fast and really only sounds good up to speed. This technique is very popular in the classical/flamenco world and really does sound wonderful at a certain tempo. If you want to impress a girl (or guy) that you like, then mastering this nigh on impossible technique will likely win their hearts. In this first tremolo pattern play the bass note with the thumb and then the B string, first with your second finger followed by your first finger. Repeat endlessly... Try just on one chord to start with. Here is the tremolo technique but played as sixteenth notes. This time we play Thumb, 3rd, 2nd, 1st over and over. Now we continue with tremolo technique but start to move the bass notes around. Recuerdos de la Alhambra is a true musical masterpiece written by Fransisco Tárrega in 1896. It's really the ultimate song to practise if you want to work on your tremolo skills. This pattern is the exact pattern used in the piece. It uses 32nd notes (demisemiquavers) which means that you cram 8 notes into one quarter note beat, allowing you to play very fast at slow tempos. The next few fingerpicking patterns are focused on muting the bass strings via palm muting technique. This really tidies up your playing and is a crucial skill to use frequently. Luckily it's not too tricky. Just place the palm of your hand lightly over the saddle of the guitar and touch the strings with the flesh of you hand. This will mute the strings but still produce a nice clear tone. Really work on getting the bass notes to be the blanket for the higher notes. You've got to have a nice tight sound here and it'll again help you sound as if there's two guitars playing. The same here but now alternating across the bottom three strings. Remember your thumb must be rock solid at all times, it's easy to let it be sloppy and miss the correct string. Always be thinking about the thumb! A nice combo of 16ths and 8ths. Think about the frequency of all the notes you're playing - do they marry together well and produce a truly clear sound? Touch is so important! One last muted bass pattern. 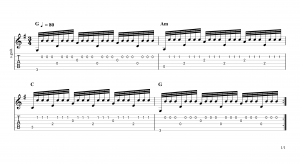 The next two fingerpicking patterns take inspiration for Fleetwood Mac's guitarist Lindsey Buckingham, specifically from the song 'Never Going Back'. Buckingham is an incredible guitarist all round, but his fingerstyle playing especially is something to shout about. This pattern is tricky and requires really slowing it down and watching meticulously to make sure you're playing the right strings! With your 1st, 2nd and 3rd fingers you play descending 8th notes continuously, and with your thumb you play quarter notes across the bass strings. Here's the same idea but this time the 1st, 2nd and 3rd fingers go in the other direction. You can do this pattern starting on any of your 1st, 2nd or 3rd fingers. This pattern is a combination of 16th note triplets and 16th notes. Here's a nice blend of 16th note triplets and 8th notes. It creates are really nice sweeping flow. Here's a great triplet roll that again sounds sweeping. You can really crank the speed up on this one! Moving back to some shuffle fingerpicking patterns now with some more melodic notes playing on the high register string. In this pattern, adding the triplet rolls at the end of each chord is quite challenging. Try to keep the thumb shuffling along and don't let it play on each of the triplet notes like it'll want to. Now the bass plays quarter notes on each beat and the 1st/2nd fingers play the shuffle. Again, put the thumb in its place and don't let it play the shuffle. Keep an eye on that thumb! Here we add some extra bass notes and it really adds a nice groove to the pattern. Another triplet shuffle groove to mark the 100th fingerpicking pattern! The final fingerpicking pattern is based on the song 'Rhiannon' by Fleetwood Mac. Lindsey Buckingham plays a sneaky bass note rhythm over the chords that's pretty nasty to get right. Sounds great though! 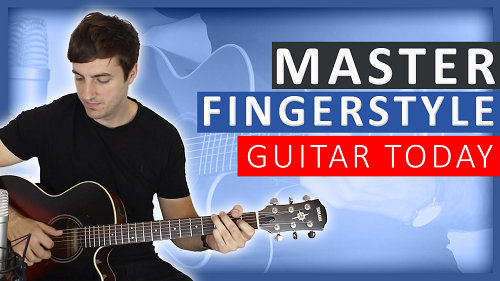 Thank you for visiting this lesson, I really hope that it gives you many fingerpicking patterns to work on and helps you to develop your own in time. I'd love to hear your thoughts on the patterns and how you get on with them. I'd also love to help you out it you're having any difficulties, just send me a message or leave me a comment below and I will get back to you. I hope you've found this lesson useful. If you're interested in taking Skype lessons with me and taking your playing to the next level then just click here to find out more and book your first lesson. Don't miss my regular fingerpicking lessons by subscribing to my Youtube channel. I do weekly lessons teaching fingerstyle guitar songs and other useful fingerpicking techniques. I’ve been practising the first 40 patterns and I really enjoy playing most of them. Thanks for putting them here! Just one comment, it would be awesome to transfer the knowledge learned here to play real songs – do you think you could put one or two songs to eacht pattern where it is used? Hey Joe, glad you’re enjoying the patterns. That’s definitely something I’d like to do, I want to make them all as good as possible. I’ve got a lot going on at the moment but I’ll strongly consider your suggestion for the future.